The two completed BS Illumina libraries (400ppm and 1000ppm) were quantified via fluorescence using the Quant-iT DNA BR Kit (Life Technologies/Invitrogen). Used 1uL of each sample and the standards. All standards were run in triplicate. Due to limited sample, the two libraries were only processed singularly, without replication. Fluorescence was measured on a FLx800 plate reader (BioTek). The 400ppm library looks great, with a good yield. The 1000ppm library appears to have no measurable quantity of DNA in it. This is surprising, and disconcerting, as both samples were processed in parallel. As such, there should be virtually no difference between them, in regards to the library construction process and subsequent yields. To verify that this wasn’t a pipetting error on my part, I re-quantified the 1000ppm library (in duplicate) and still no detectable DNA. Will repeat the bisulfite conversion and library construction process on the 1000ppm sample in order to generate a usable library for sequencing. Due to differences in input DNA quantities, samples were run with different numbers of thermal cycles. 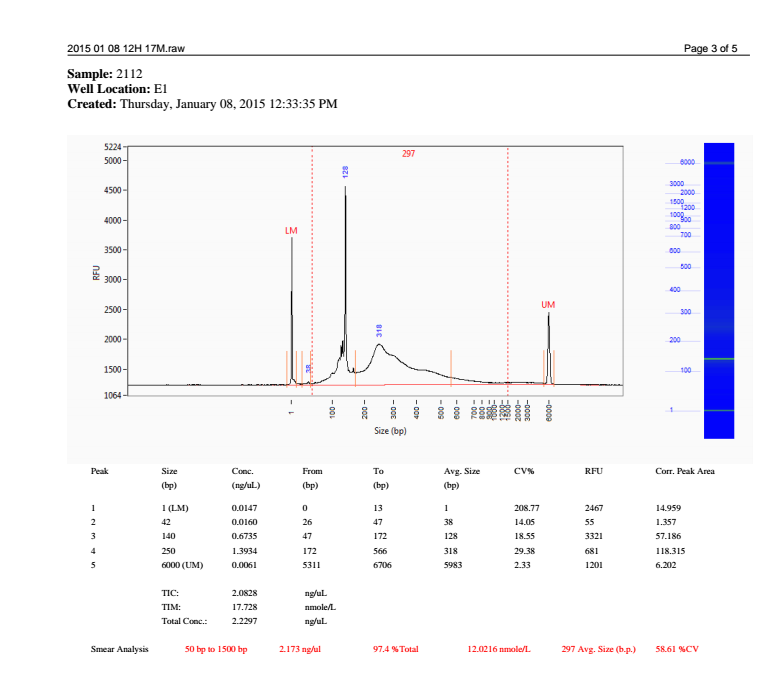 Samples were quantified with 1uL of each sample using the Quant-iT dsDNA BR Kit (Invitrogen). Used 5uL of each standard and standards were run in duplicate.